This useful set of playdough mats helps children who are beginning to sound out their letters and recognise beginning letters sounds, by providing an example of a beginning letter word and a picture, and asking them to think of, and model, some more. Great fun for some imaginative playdough play! Download the complete set in one pdf file, or download them one at a time if you prefer. Here is the complete set of our "begin with the letter" playdough mats for you to download in one file, if you prefer to have them all in one place. For repeated use you might want to laminate them. Or just print and throw away after each modelling session. This set of playdough mats goes all the way through the alphabet asking children to think of things beginning with each letter to model with their playdough. I think if it was me, I would model an egg. I wasn't very good with my playdough! It's fun to model Fish with playdough, for the letter F. What else can the kids come up with that begins with the letter F? Girl begins with the letter G. What else can the kids think of to model with their playdough? How about a giant - or a grasshopper! A hat is a fun thing to model out of playdough, but there are many alternatives beginning with the letter H. What can the kids come up with? An igloo is just one thing that begins with the letter I. What else can the kids think of to model with their playdough? How about an iguana? Modelling leaves out of playdough is lots of fun - especially if you press real leaves against the playdough to impress the markings! But there are lots of other things beginning with the letter L that they could model too. Perhaps a lemon? Or a lion? 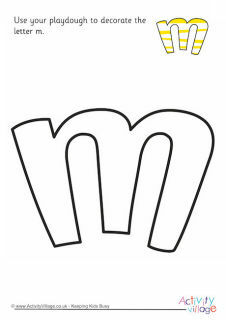 Model a mouse out of playdough - or a monkey, or a matador, or a mat ... whatever the kids can think of beginning with the letter M! A pirate begins with the letter p - but so do many other words that the kids can make with their playdough! A yawn begins with the letter y. What other words beginning with the letter y can your kids think of - and model with their playdough?